An ebook edition of this title is available from Kindle, Google Play, and Apple iBooks. A spiritual memoir and travelogue, God through Binoculars: A Hitchhiker at a Monastery is about where you go when you have nowhere left to go. After a difficult childhood and a series of tragedies and misfortunes, author Danusha Goska finds herself without hope for the future. Supported by her passion for travel and discovery, as well as her commitment to Catholicism, Goska decides on a retreat at a remote Cistercian monastery. What results is a story about family, friends, nature, and God; the Ivory Tower and the Catholic Church. God through Binoculars is utterly naked and, at times, politically incorrect. Some readers will be shocked. Others will be thrilled and refreshed by its candor, immediacy, and intimacy. Her previous, highly-rated book, Save Send Delete, was enormously well-received, and readers will find that Goska's ability to tell a masterful story with a powerful message continues in God through Binoculars. Danusha Goska was born in New Jersey to peasant immigrants from Poland and Slovakia. Her grandfathers were coal miners. Her dad mined coal as a child and fought in the Pacific Theater in World War II. Her mom cleaned houses and worked in a candle factory. Danusha has lived and worked in Africa, Asia, Europe, on both coasts, and in the heartland, of the US. She holds an MA from the University at California, Berkeley, and a PhD from Indiana University, Bloomington. Her writing has been awarded a New Jersey State Council on the Arts Grant, the PAHA Halecki Award, and others. 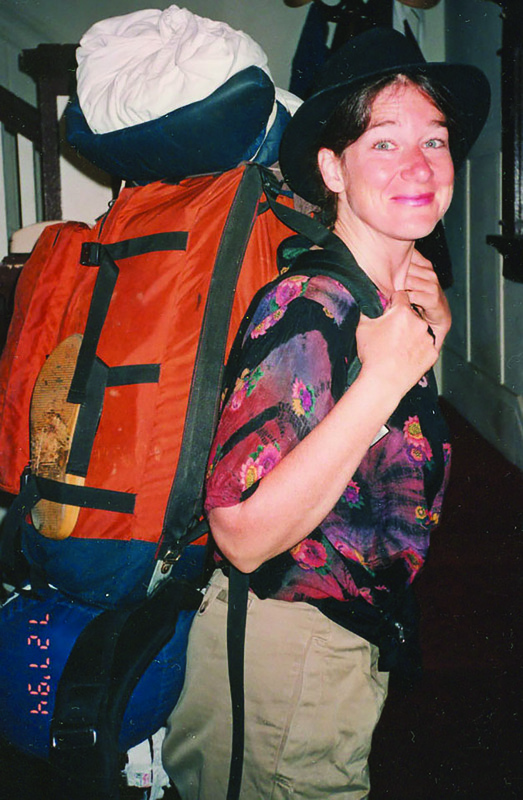 Reviewers have called her work “inspirational” and “groundbreaking.” Her book Save Send Delete was inspired by her relationship with a prominent atheist. Julie Davis, author of Happy Catholic, called Save Send Delete one of the ten best books of the year. “You catch a monkey, they say, with trinkets in a wide-bottomed, narrow-necked vase. The monkey inserts his paw, and opens it up to capture his treasure. When he tries to withdraw his fist, he can either hold on to the trinkets or let them go and free himself. “Jesus invited, ‘Leave everything you have, and follow me!’ That might seem fairly easy for a pilgrim who can’t afford her own car. But even the poor must surrender. 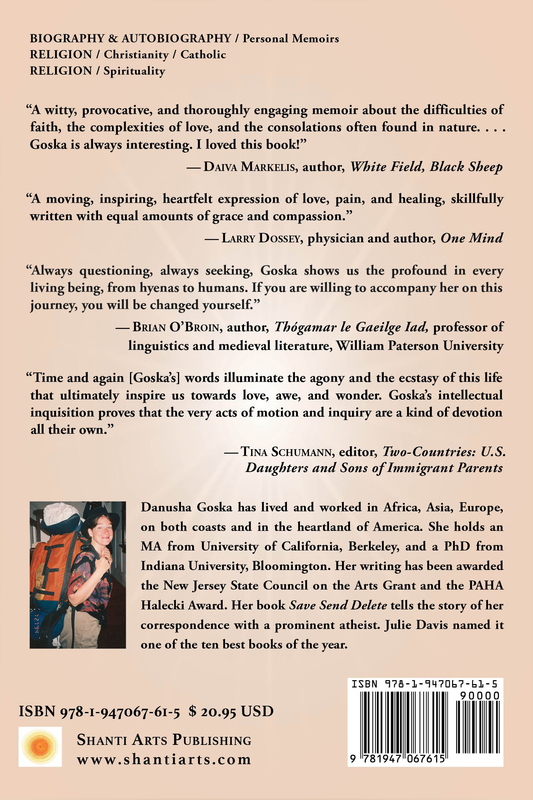 “Goska’s monastery journey is a meditation on the deliberate opening of hands. With the slow freeing of each finger, another trinket is jettisoned and a new perspective is revealed. Nature provides her window to the divine: indigenous fruit, a hawk’s soar, and being arrested by an unlikely savior. This hero’s journey ends where she began, but as a new person, with a new vision. — Edwin Woodruff Tait, writer, farmer, and consulting editor, Christian History magazine. John E. Rafferty, God through Binoculars: A Brief Review, American Thinker, April 13, 2019. Filip Mazurczak, A unique credo and affirmation of faith by a distinctive mind, The Catholic World Report, March 11, 2019. 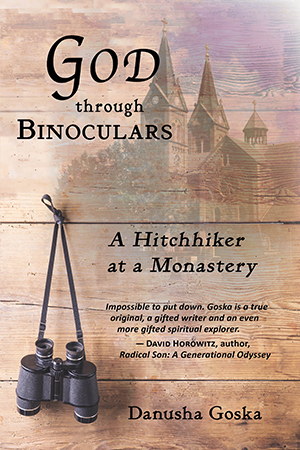 Julie Davis, God Through Binoculars by Danusha Goska, Happy Catholic, February 22, 2019. Jeffrey Miller, Book Review: God Through Binoculars, The Curt Jester, February 26, 2019. Bruce Bawer, God Through Binoculars: A Hitchhiker at a Monastery: A Beautiful Mind Produces a Luminous Memoir, Frontpage, December 17, 2018. Van "Ze'ev, "Wallach, God (and Torah) on the Road to a Monastery,The Times of Israel, December 29, 2018.